Retired Brigadier and former Chief-of-Staff of the Guyana Defence Force, Edward Collins taking the oath as Commissioner before Chief Magistrate Ann Mc Lennan. The Commission of Inquiry into the discovery of an aircraft in southern Guyana is expected to determine whether there was effective sharing of information among the security forces. This provision of the ter‎ms of reference comes against the background of the fact that at least one law enforcement agency was aware that the aircraft had been in that location for at least three weeks prior to the official announcement of its discovery by the Guyana Defence Force (GDF). The army said the twin-engine Cessna aircraft was found September 13, 2016 on the ground near Yupukari Village, Region Nine. Demerara Waves Online News has previously reported that at least one law enforcement agency had known of the presence of the plane there and had been awaiting the return of technicians to repair the aircraft to arrest them and any other associates. 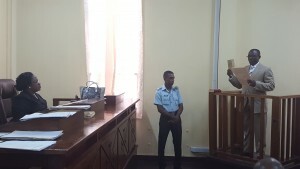 Brigadier Collins, who was sworn in by Chief Magistrate Ann Mc Kennan on Wednesday morning at the Georgetown Magistrates’ Court, has until November, 2016 to complete and submit his report to President David Granger. Collins is also tasked with advising the President on the operational effectiveness of the various agencies of the State and the adequacy of existing human resources, technology and equipment in Region Nine as well as the coordination among the various state agencies and other local and regional entities as it relates to the sharing of intelligence.